Non-fiction – paperback; Penguin Viking; 408 pages; 2004. As far as publicity is concerned, Midnight Oil has always been a closed shop. So to find a book that charts the band’s climb from the Australian pub rock circuit to worldwide critical acclaim is a rare treat. Midnight Oil are an unusual act, not least because they have always played their cards close to their chest, but because they have been synonymous with so many causes — aboriginal land rights and conservation, to name but a few — while achieving commercial and critical success at the same time. In Australia, their homeland, they have been elevated to iconic status. In fact I know of no other band anywhere that has tapped into the Australian psyche and culture so well. Listen to their ground-breaking 1987 album Diesel and Dust and I swear you can smell the desert, see the heat shimmering in the distance and feel the sand sticking to your skin. 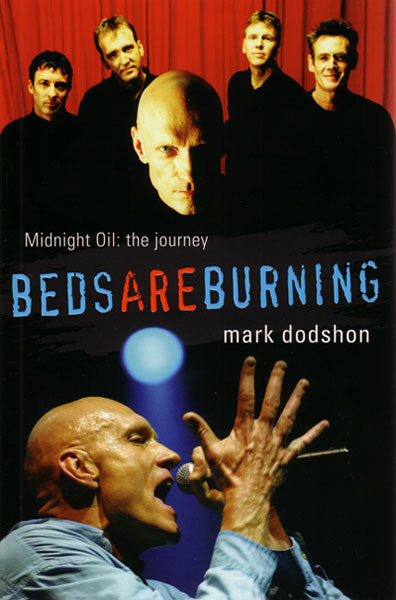 Their lyrics, rich with descriptions of the Australian lifestyle and landscape, were often attributed to the politically outspoken and charismatic lead singer Peter Garrett, but as this book explains, it was the softly spoken Jim Moginie and the “world’s best drummer” (who mirrored himself on The Who’s Keith Moon) Rob Hirst who wrote the bulk of the words. This book examines the band’s rise from the suburbs of Sydney to their brief but memorable success in the United States and their subsequent slide into obscurity. It looks at the individual members (but not their home lives — this is not an exposé of their life outside of music) and how they worked (or did not work) together to create the songs and the albums of their long and varied career. I thought it was an enlightening read, although there is quite a bit of repetition in the book (I expect so that each chapter can be read as a stand alone), but on the whole this is an excellent history of my favourite Australian band. There’s also some great photographs in it, particularly some previously unpublished ones of Garrett with long, flowing locks which are worth the cover price alone! Interestingly the epilogue entitled As Big as U2 is a thought-provoking analysis of why the band never hit the same dizzy heights as the Irish rockstars, despite the fact Midnight Oil were often compared to them. In light of U2’s current “commercialisation” I know whose shoes I’d rather be standing in right now. Integrity and passion were always Midnight Oil’s stronger points, although not many people “got” that at the time.